What did I do this week? 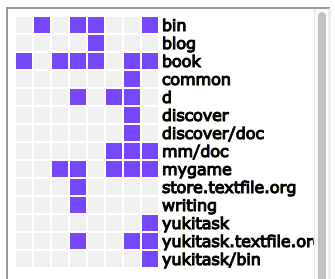 YukiTask Graph answers to you. You can see what you have done in these days as follows. Blue box = You did mk of the project on the day. Gray box = You did not mk on the day. When you mk, touch_task is executed automatically. touch_task stores current date and the current directory name into ~/yukitask/log.json.